We reached a huge milestone in the Yes on 1631 campaign this week. 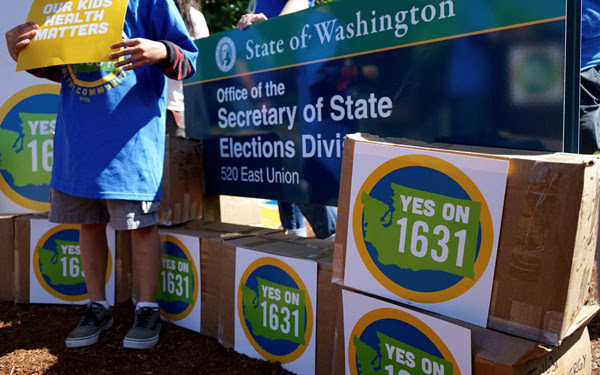 With over 375,000 signatures, I-1631 achieved one of the highest number of signatures ever gathered on a Washington State ballot initiative. Come celebrate with us Thursday, July 19 at the Yes on 1631 Volunteer Appreciation Party! As much as this is a moment to take a breath after months of hard work, it’s also now that the real fight begins. We expect the fossil fuel industry to spend up to $25 million opposing I-1631. But we have something more powerful than money—people power. With the help of literally thousands of volunteers, the Yes on 1631 campaign intends to contact over one million Washingtonians between now and November 7th. But we can only do that with a lot of help. To stay up-to-date and to get involved with Yes on 1631, please fill out this short form here. RSVP and invite friends, then share the event page! Friday, July 20, 10:00am–8:00pm, Zero Hour Art Build! The march ends at Judkins Park with Climate Action & Solutions tabling. Reserve table space for your climate action/solutions group, church group or business. It’s BYOT—bring your own table—at no cost, but please, register with Sue. If you are a young person interested in organizing the march, art build and lobby day please contact us! We need your help to make Zero Hour Seattle as powerful as possible! Frontline Allies welcomes your participation in everything from organizing trainings on undoing racism and other oppressive systems, to supporting our allies in climate-related justice work. To join contact Kara; more information and links are available here. Learn more about the women of the Arctic National Wildlife Refuge and their fight to protect their sacred lands and culture from oil drilling and development. The Pacific Northwest has a unique political and cultural connection to the Arctic, and you can be part of the efforts to protect it. Join renowned filmmaker/athlete/activist Miho Aida to learn how you can join the Gwich’in Nation in defending the Arctic Refuge’s sacred lands from dirty fuels! RSVP here to learn more. Other regional events listed here. Help is desperately needed to support indigenous educational resources. An important program for Native Learners currently boasts a 100% graduation rate and provides needed resources like tutoring, meals, and cultural events at Robert Eagle Staff Middle School. Your support could mean the difference between this program being cut from the budget or continuing its amazing work. For more info, talking points, or how to sign up to testify, visit this event page. Stand with the First Nations fighting to stop Kinder Morgan! Be part of the ceremony and celebration of water on the beach or float with the flotilla on the water. More information here, and if you can help make the day a success, please volunteer. Here is a link for group carpools. Elder Ta’ah Amy George asks that Indigenous folks bring traditional medicines, and their kayaks or their canoes. There will be heart-stopping dance performances, inspiring Indigenous speakers, musicians, and a tent for kids. Note that July 14th is a spiritual day of ceremony focused on the water; there will be no bold actions. Solidarity Presence with Fidel for ICE: Stand with Fidel Ventura Antonio who is facing deportation. Tuesday, July 10, 9:00am till Noon, 12500 Tukwila International Blvd., Tukwila 98168. Tacoma City Council Meeting: Public Comment about Tacoma fencing off the NWDC to stop protests. Tuesday, July 10, 5:00–8:00pm, Tacoma Municipal Building, 747 Market St., Tacoma 98402. People deprived of shelter sleeping in the streets in the world’s richest country, climate chaos, man-made environmental disasters, children separated from their parents and locked up in cages… If you’re wondering how we got here, join us for the completion of our discussion of Roxanne Dunbar-Ortiz’s very illuminating book and participate in the decision on what to read next. Last February, thirteen young Washingtonians filed a lawsuit alleging that the State of Washington is violating their constitutional rights by causing climate change. On June 1, 2018, the State of Washington moved to dismiss the youth’s case. This Friday, the young climate warriors in Piper v. State of Washington have a hearing which will determine whether their case can proceed to trial. A press conference will follow the hearing, where you’ll have the opportunity to hear from the youth plaintiffs and their attorneys. Join us in solidarity as the youth enter the courthouse and to hear a few words from them and their attorneys. This hearing is open to the public! Michael Foster has been granted early release from prison, arriving at the Seattle Bus Station at 11:50pmon Wednesday, August 1! If you would like to welcome Michael at the station and have a celebratory drink, contact Sue. Michael wants to thank you for helping him replenish the MRCC prison library. He has received over 100 books. Because he will be home soon, letter writing and the book drive has ended. All the cards, letters and books you sent have made Michael’s time in Bismarck much easier. Thank you, friends! Most importantly, Michael’s request of us is that we help with the Zero Hour Seattle Youth March that the Plant for the Planet kids and others are working on—details above. Have you gone to a meeting and left still feeling like you are not quite sure how you want to plug in? Community Resilience understands that sentiment! We have supported people to find their own ways to contribute to the movement via massage offerings, video and editing skills, carpentry and even gardening. We need everyone! Contact Alexandra Blakely to discover different ways to get involved. On Sunday, July 15th, join this evening kayak tour in Olympia benefiting 350 Seattle as the day transitions to an impressionist painting and Mt. Rainier illuminates in orange and purple. We expect to see the glow of bioluminescent dinoflagelletes in the water after dark. Click here to purchase a ticket. The $100 ticket includes the tour and tandem kayak, paddles, life jacket (PFD), spray skirt, safety gear, expert naturalist and sea kayak guide, and boat lanterns. You cannot bring your own kayak. Thanks to Kayak Nisqually for donating this tour so all funds raised will benefit 350 Seattle. In addition to bioluminescent night paddles, Kayak Nisqually offers wildlife watching tours lead by biologist guides with backgrounds in conservation biology. The Salish Sea urgently needs our protection! Throughout the bioregion our sacred water faces a cumulative toxic load from multiple fossil fuel projects and pollution. As acid oceans impact declining shellfish and salmon populations, orcas are starving. Water is life for all living beings. What we do to the water, we do to you and me. Locations all around the bioregion of the Salish Sea will host distributed actions at locations on both sides of the border from the north end of the Strait of Georgia to Puget Sound and Hood Canal. Please help us spread the word to groups who may be interested in hosting events on Saturday, September 15 for the Salish Sea Day of Action. We are uniting our voices to tell the world and our local decision makers that we demand protection for the Salish Sea. For more information, please visit this event page. Still stuck on coal and clueless about gas, Puget Sound Energy needs to deliver a blueprint for a carbon-free electrical grid. Instead, they’ve started another two-year planning cycle by trying to limit the voices of concerned, committed and well-behaved community members. Several groups with better manners than us have been excluded from this month’s technical meeting. Want to join us there and see how it goes? If we let PSE decide who the experts are, frankly, we’re screwed. Their for-profit business model is based on getting state approval for big capital projects, not providing renewable energy, as their pervasive greenwashing would have you think. Read more here about their 2019 Integrated Resource Plan process and then mark your calendar to give them a piece of your mind on August 28, the first of four public comment opportunities. Our collaboration with NoLNG coalition partners in Tacoma and Seattle continues to raise awareness about this project as we prepare for the PSCAA (Puget Sound Clean Air Agency) comment period on the Draft Supplemental EIS (Environmental Impact Statement) coming up this fall. Their analysis will cover all air emissions and greenhouse gases emitted by the LNG project, from the extraction of gas from fracking to the combustion of methane based fossil fuel in ships and residential homes. This lifecycle perspective is a first for the PSCAA—it looks like they’re starting to understand the scope of the problem. Please sign this form thanking the agency for their important analysis and urging them to assess the hazards of fracked gas on our air and climate. And plan on a public hearing October 30th. Save the date for September 8th when we join 350 Tacoma and other local groups on a march from the LNG facility at the Port of Tacoma to the Northwest Detention Center (located within the LNG blast zone). We’ll draw the connection between how the issues of immigration and refugees are made worse by climate change, and how important it is that we deal with this in a much more humane way. (A great article on the connections between climate and immigration is available here). This action will be one of many Rise for Climate actions across the world that day, demanding our local leaders commit to building a fossil free world that puts people and justice before profits. And talking of LNG, the Puyallup Tribe is hosting this year’s Canoe Journey landing and gathering at the end of July. If you would like to witness this and can also help with the Green Team, sign up here. Do you live or work in the Puget Sound Energy (PSE) service area? Would you like to organize a presentation in your school, church, organization, or neighborhood about the Liquefied Natural Gas (LNG) plant that PSE is building in Tacoma? Stacy, Renee, Carlo, Jim, and Mary have created a comprehensive slide-based presentation on the “Risks and Impacts” of this methane project being built next to Puyallup land and many communities. and in August on Vashon. Please contact Mary Paterson for more information. A big shout-out to everyone who sent in comments to the Department of Ecology last month asking them to deny the water permit for this unneeded pipeline expansion, disguised as a replacement, which would double the amount of fracked gas supplied by PSE to North Seattle homes. Thanks to the last-minute surge of public comments, the DOE extended the comment period deadline by 3 weeks. Together with 350 Eastside, 350 Everett and other local groups, we’re working on next steps to stop this proposed project and make the case for a transition from fracked gas for heating and cooking to more efficient electric and solar options. Live in south Snohomish county or north Seattle and want to help? Drop us a line! Washington State’s Electric Vehicle Action Plan needs help moving forward, particularly in the state legislature, so the Transpo team and the Policy work group are teaming up with Coltura and others on the Internal Combustion Engine phase-out bill. Sound like fun? Contact Andrew. We need free transit for all to help us get out of our carbon-spewing cars. Transit passes for UW employees, more and more of whom are being pushed to the suburbs by the rising cost of housing in Seattle, is a great start, and also only fair. The more folks turn out to this hearing (and press conference), to support transit passes for UW employees, the better. RSVP on the event page. We’re working on a dynamic fall forum with lots of perspectives on the intersections of housing, equity, and climate. We’re also plotting fall campaigns to make a speedy, real, and lasting difference to the housing crisis. Email Emily if you’d like to be involved! Trump’s chaotic and random approach to trade with Mexico and Canada means that negotiating a new NAFTA appears to be on hold. Nevertheless, we’re continuing to push with our Congressional reps a new trade policy that addresses climate, worker rights and human rights. This includes pushing the Washington Fair Trade Coalition’s new white paper on trade, which we can modestly say we helped write. Contact Selden Prentice for your free copy! Alongside our friends at Rainforest Action Network and Greenpeace, we’re continuing our campaign against JPMorgan Chase’s funding of extreme fossil fuels. Thank you to everyone this month who made calls asking them to not renew their $625 million loan funding Enbridge, the corporation behind the disastrous Line 3 pipeline. We will let you know as soon as we do whether or not Chase did the right thing and dropped this heinous company. As we move forward, we’re exploring the idea of hosting a “Chase Customers Day of Action.” If you’re a Chase customer and are interested in participating, please email Alec for more details. With the awful news that the City of Seattle has been forced into spending three more years with the climate-wrecking bank Wells Fargo, all eyes are on the City’s public bank feasibility study, which we expect to be finished in August. To learn more about why a City of Seattle public bank would be good for our climate and for our city check out our We Need a Public Bank blog. HELLO SUMMER! Huge thanks to everyone who came to the Solstice art builds to help us create such an amazing summer solstice ensemble. Over 800 paper flowers made, two floats, butterfly wings, trees and so much more was created and lovingly, wonderfully used to dance and share the story of what we need to do to have a “COOL EARTH”. THANK YOU to all the wonderful people who showed up at the parade happy and ready to dance and laugh and play!! We have so much love for you all! Family friendly build creating your own signs for the Zero Hour Seattle march on July 21st. More info on Zero Hour March here. Youth, teens, and families, along with skilled Artists Allies, come help design, find a high traffic area wall, and work on an outdoor permanent wall mural in the Summer and then bus shelter mural painting this Fall. Contact Doug to get involved in the art and find the location. Join the Deployment Team! Ever wish you had a role during actions and events? Come learn crucial skills with us! We need you! Contact Shemona. DOES THIS MEAN WE NEED A BOARD ROOM? 350 Seattle is in the final stages of an exciting restructuring process, designed to distribute power and governance responsibilities to a wider group of people working toward climate justice. We are recruiting four people for our Board of Directors. Could you be one of them? 350 Seattle is not a traditional non-profit organization. We are a volunteer-driven grassroots organization that employs a range of strategies to affect change locally and regionally on climate. We’re increasingly becoming a political force at City Hall, and a nationally-recognized leader—with our power coming from bold action and an artful vision of the kind of change we need. We continue to do all this work through a justice and equity lens. Is your interest piqued? Read more here. Just last week we found out that Nancy Nordhoff is offering a $20,000 matching gift to us. So, we only need to raise $20,000 to receive this generous donation! This couldn’t come at a better time—a couple of grants that we thought we had a good chance of receiving didn’t come our way. Help us fill this gap, receive the matching gift, and invest in grassroots climate action! Help us receive a $20,000 matching gift! NEW! Donate stock: All the details on how to donate here. Stay hydrated and cool as new beans, friends—water your moxie!